In order to bring you fresh and more frequent content to Hip Hoop Junkies, we are proud to introduce our newest writer Mike Masaya, to the HHJ fam. Mike is based out of Montreal and is a big time hoops head. To help introduce Mike to the readers, I got a chance to ask him a few questions about the content he's going to bring the site, his thoughts on the Raptors and his favourite Vancouver Grizzly of all-time. Romy (HHJ): First off, welcome to Hip Hoop Junkies….who is Mike Masaya? MM: Born and raised in Montreal, Quebec I’ve been a basketball fan for as long as I can remember. Spending my entire childhood and adolescence on the outdoor courts, only taking breaks to eat. Luckily, my high school principal was a basketball referee and hoop junkie himself. He was so desperate for hoops, he herded students to participate in March Madness pools, which when I look back at it now, is pretty funny and likely only fueled my basketball obsession. As the years passed my love for hoops only grew and I started watching and writing about the game from different points of view, and started breaking it down on many levels. With friends who have coached, played in college as well as internationally, I am always learning something new about the game. Learning things that not only bring light to common misconceptions, but also offer me real life experiences and stories that are invaluable and allow me to appreciate the game even more. Romy (HHJ): What kind of content are you going to bring to Team Hip Hoop Junkies? MM: Basketball is as much about Xs and Os as it is about numbers. When I look at box scores and averages I only see a part of a bigger picture. Over a period of several games I like find trends that can show the improvement or decline of players performances, under which scenarios players excel and how much effort is being made on the offensive or defensive end. Numbers can also show you if the coach is managing players roles and minutes in a way that is beneficial to the team. I look forward to sharing my theory of numbers with all the Hip Hoop Junkies fans and hope they enjoy my thoughts on stats, and if they don’t, I hope I can at least make them look at stats in a new way. And yes, great consideration is made to the efforts that don’t show up in the stat column, as those uncharted statistics more often than not increase teammates performances. Romy (HHJ): You’re based out of Montreal, what was your first NBA basketball memory as a kid? MM: As a kid, the Sunday house rules were ‘homework done by dinner time’. Only problem with that was NBA triple-headers on NBC started in the early afternoon and didn’t end until well into the evening. So I did what any kid would do. I woke up early and finished all my homework before game time and spent the rest of the day sitting cross-legged less than five feet away from TV. At the time NBC aired a lot of Chicago, Utah and Phoenix games, which would explain my early fascination with Jordan, Grant, Stockton, Malone, Johnson and Barkley. This also explains my soft spot for the Power Forward and Center positions, which ended up being my favorite position to watch and play. 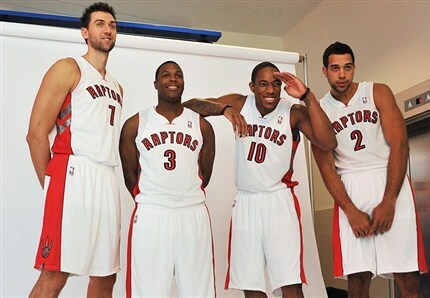 Romy (HHJ): What is your outlook on these 2012-2013 Toronto Raptors…..are they a playoff team? MM: Yes. The Raptors clearly have a solid starting five and some of the best quality back ups at each position. If the starters can remain consistent in their scoring, the 2nd unit is has shown they are going to be pushing the pace and are capable of not just maintaining leads, but adding to them. It will however be very important for the Raptors to take advantage of all their bigs on the inside, and move away from constantly shooting mid range jumpers if they want those dreaded close game losses to turn into close game wins. Romy (HHJ): Ready for rapid fire questions? Who will have a better rookie season....Jonas Valanciunas or Terrence Ross? MM: Jonas. But only if the team makes a concentrated effort to get him the ball inside. Ross will have a hard time dealing with elite shooting guards in today's NBA. Romy (HHJ): Who is the most dangerous team in the NBA right now? MM: Miami Heat. With three all-stars and a hall of famer that can still compete, they will be playing every game with a chip on their shoulder, giving them that added edge, energy and effort. Romy (HHJ): Which player is going to surprise NBA fans this season? MM: Klay Thompson from the Golden State Warriors. Likely a starter this time around and with no Monta Ellis, Stephen Curry is sure to get him the ball more often. With defenses collapsing on Bogut and Lee, he should have an easy time hitting his reliable jumper. Romy (HHJ): Favourite Vancouver Grizzly of All-Time? Romy (HHJ): Favourite Steve Nash hairstyle? 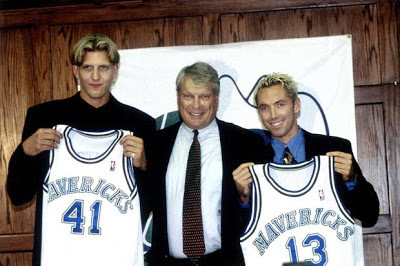 MM: 1998 press conference trade to Dallas and his blonde highlights. If Montreal had an NBA franchise…..it would be the Montreal ________? MM: The Montreal Protesters, and every call would be questioned by its players and fans, which would of course end with a protest outside the arena.